In this day and age, whenever someone mentions the best mop, you can be sure that the person is talking about a microfiber mop. 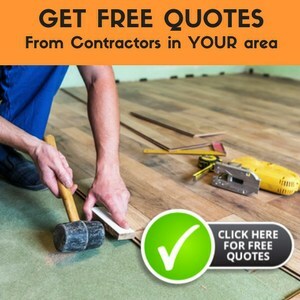 This is especially true when we’re talking about the best mop for hardwood, a surface which does not fare well with too much water or overly strong detergent. A microfiber mop can pick up the tiniest dirt and debris from a hardwood floor without the help of water. In fact, most of the time, you will not even have to loosen the dirt with soap or another cleaner. All you need is a dry or slightly damp microfiber mop pad to pick up anything and everything from a hardwood floor. So now we know it has to be a microfiber mop, but the question is, which make and model? Any microfiber mop is much better than the traditional string mop for hardwood floors. The Homevative microfiber spray mop, now in its v2 iteration, is a contender for best mop for hardwood title. This is a kit with Homevative microfiber spray mop v2, three microfiber mop pads, two bottles, and the Precision Detailer. According to Homevative, each microfiber pad can be washed way over 100 times. The bottles are for spray mopping, and you can prepare your own solution in the bottles. The Precision Detailer is a hand tool for scrubbing hair and other gunk off the microfiber pads. 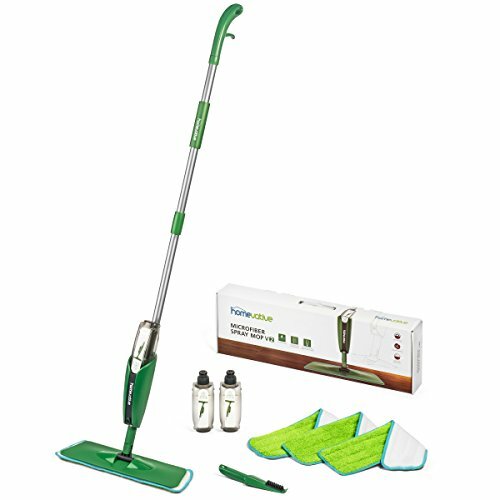 The Homevative microfiber spray mop v2 comes in 3 pieces: the top pole with hand spray, the middle pole with spray bottle, and the swivel head. Silicon O rings are used to stop the water from leaking except when released by the hand spray. This microfiber mop does an excellent job of cleaning a hardwood floor without water. Most of the time, you can even skip vacuuming the floor first. We found that the spray function is only needed for very dirty floors. The swivel head is a little flaky when pressed onto the floor—most of the time, it will skip instead of delivering deep cleaning. A few owners complained of leaks after a few weeks. As previously stated, the best mop for hardwood is a microfiber mop. The Homily microfiber spray cleaner also features a spray mop design with a microfiber pad like the Homevative microfiber spray mop kit. The differences are in the specific designs. The Homily microfiber spray cleaner is beefier through and through. The newly redesigned spray bottle is large (650ml capacity) and made of ABS engineering plastic. Homily claims that you will never have to worry about leaks with this best mop for hardwood, and we’re inclined to believe them. We love the feel of this mop. The relatively thick pole is made of very light aluminum alloy, yet it is beefy enough to inspire confidence. You can really apply pressure on the mop head for a thorough cleaning. The spray area is rather narrow, but useful enough. The spray bottle holds enough water for multiple cleanings and we never had to use anything stronger than water for mopping and cleaning hardwood floor. The box contains two microfiber mop pads. The 360-degree swivel head features a generous 15-inch width. 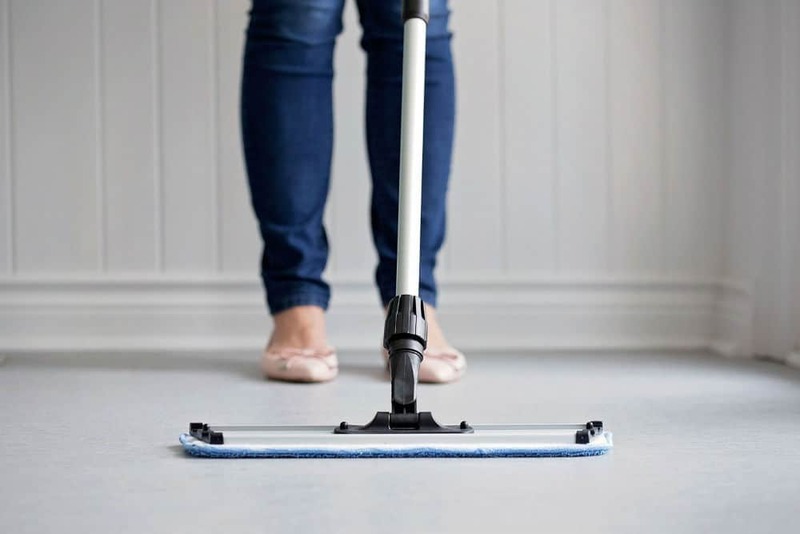 Our search for the best mop for hardwood could have ended right here except we were curious to see whether spray mops were absolutely necessary for cleaning hardwood floor. Mop with as much or as little force as you see fit. We are awfully glad we kept looking. It’s true—the best mop for hardwood does not have to be a spray mop at all. Check out the Keeble Outlets professional dust mop and you will agree. The first thing you’ll notice about the Keeble Outlets professional dust mop is the number of metal parts. The few plastic parts look hard and strong, and well-built enough and are unlikely to break if dropped. Our impression is perhaps confirmed by this microfiber mop’s lifetime warranty. First of all, it’s extremely rare to find any mop that comes with a lifetime warranty, and if you did come across one, you could be sure it’s pretty well-built. The most basic version comes with just one microfiber pad, but you can always buy more pads in the future. The pad can be used dry or wet. In our experience, you can totally clean a hardwood floor well enough without wetting the pad. In our experience, only high-traffic hardwood floors require a spray mop, and this is only if you routinely wait a week or so before mopping. We recommend the Homily microfiber spray cleaner if you prefer cleaning with water. 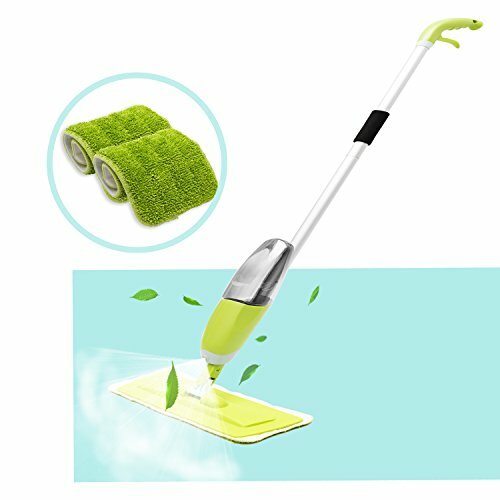 If you like to experiment with different cleaning solutions, go with the Homevative microfiber spray mop kit instead. If you are willing to mop every other day or so, the best mop for hardwood is the Keeble Outlets professional dust mop. It is very well-built for a mop, and although the telescopic handle requires a bit of practice, in no time at all you will think that the Keeble Outlets professional dust mop is the last mop you will ever buy for your hardwood floor. This best mop for hardwood even comes with a lifetime warranty.